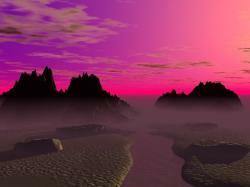 "Viruses straddle the definition of life. They lie somewhere between supra molecular complexes and very simple biological entities. 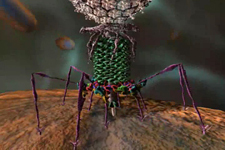 Viruses contain some of the structures and exhibit some of the activities that are common to organic life, but they are missing many of the others. In general, viruses are entirely composed of a single strand of genetic information encased within a protein capsule. Viruses lack most of the internal structure and machinery which characterize 'life', including the biosynthetic machinery that is necessary for reproduction. In order for a virus to replicate it must infect a suitable host cell". When researchers first discovered agents that behaved like bacteria but were much smaller and caused diseases such as rabies and foot-and-mouth disease, it became the general view that viruses were biologically "alive." However this perception changed in 1935 when the tobacco mosaic virus was crystallized and it was shown that the particles lacked the mechanisms necessary for metabolic function. Once it was established that viruses consist merely of DNA or RNA surrounded by a protein shell, it became the scientific view that they are more complex biochemical mechanisms than living organisms. There is no precise definition of what separates the living from the non-living. One definition might be the point at which an entity becomes self-aware. In this sense, someone who has had severe head trauma may be classified as brain dead. In this case, the body and brain are still functioning on a base level and there is definitely metabolic activity in all of the cells that make up the larger organism, but it is presumed that there is no self-awareness so the person is classified as brain dead. On the other end of the spectrum, a different criterion for defining life would be the ability to move a genetic blueprint into future generations, thereby regenerating your likeness. In the second, more simplistic definition, viruses are definitely alive. They are undeniably the most efficient entities on this planet at propagating their genetic information. Although there is no definitive resolution to the question of whether viruses can be considered living entities, their ability to pass on genetic information to future generations makes them major players in an evolutionary sense. It is a surprise to most who think of viruses simply as parasites that they make up the largest component of biomass on this planet (Bamford 2003, Research in Microbiology 154; 231-236). So far every living organism that has been studied to date has had at least one virus associated with it, and viruses out number all other life forms by at least an order of magnitude (Ackerman 2003, Research in Microbiology 154; 245-251). When considering that not only is viral presence on this planet all encompassing, but every sequenced organism to date has a major component of its genome that is viral in origin, it becomes apparent that viruses are integral players in the evolution of what we presently consider life. Organization and complexity have slowly increased from the time that macromolecules began to assemble in the primordial soup. One has to ponder the existence of an inexplicable principal that is in direct opposition to the 2nd law of thermodynamics that drives evolution toward higher organization. Not only have viruses been extremely efficient at propagating their own genetic material, they have also been responsible for untold movement and mixing of genetic code between other organisms. Variability of genetic code is arguably the driver of evolution. Through the expression of variable phenotypes, organisms are able to adapt and become more efficient in changing environments. Are Viruses Alive Sample Socratic Questions Activity- this activity explores the the question of whether or not viruses are alive. Maybe the pertinent question is not whether viruses are alive, but rather to what extent do they play a role in the movement and molding of life as we perceive it today?